On the heels of his long-awaited sophomore release, Knock Madness, LA-based rapper and label co-founder Hopsin is excited to announce a substantial tour beginning in January 2014. The 50-city tour will begin in Santa Cruz, California and make notable stops in San Francisco, Portland, Seattle, Chicago, and New York, with Hop closing the tour in his home city, Los Angeles, on March 22nd. 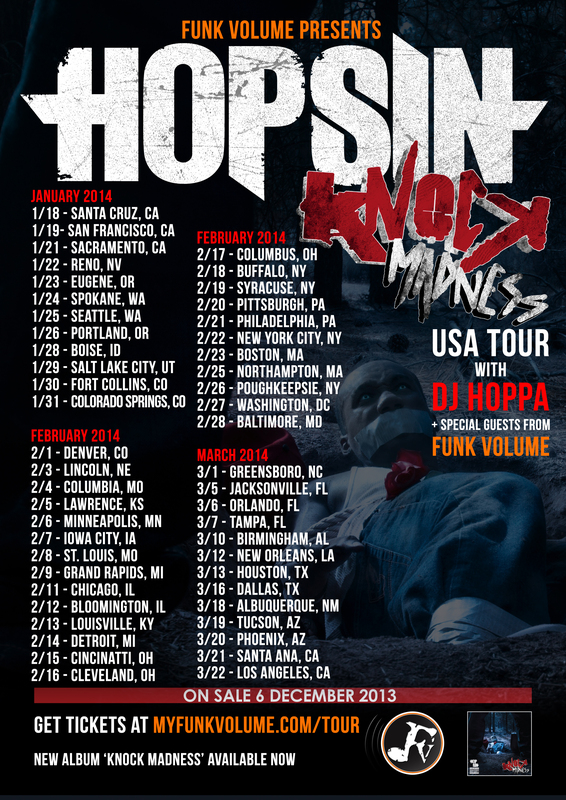 He’ll be touring with Funk Volume DJ and producer DJ Hoppa and bringing out other Funk Volume artists in select cities. Knock Madness, which sold 4k copies the day it came out and over 16k copies in the past week alone, features guest appearances from Funk Volume artists Dizzy Wright and Jarren Benton and also appearances from Tech N9ne, and more. It has received glowing responses from HipHopDX, who deemed it, “a perfect album for die-hard fans & his bar-for-bar execution and self-awareness yield a solid listen,” and from XXL Magazine giving it an XL rating, calling it “a peek into the wildly entertaining thought process of one of hip-hop’s most misunderstood characters.“ The album also hit the #2 spot on the iTunes Hip Hop charts and #4 on the overall charts within a day of its release. Overall 2013 was a busy and remarkable year for Hopsin and Funk Volume with Dizzy Wright’s growing notoriety due to his XXL Freshman selection, the release of Jarren Benton’s debut album My Grandmas Basement, and the recent release Funk Volume’s Independent Living documentary, which is available for streaming or purchase here. The Knock Madness USA Tour signifies Funk Volume’s plan to maintain the rapid pace of their encroaching dominance in 2014. Tickets and copies of Knock Madness are available for purchase now via MyFunkVolume. 3/01/14 – Greensboro, NC @ Greene St. Please contact Michelle or Dan if interested in talking with Hopsin. Panorama, California native Hopsin faced many obstacles and controversy to get to where he is now. Hopsin’s obstacles first began as a child, being placed in special education classes and forced to believe that he would never amount to anything, which caused him to drop out of school completely in 2004. By 2010, Hopsin unhappily signed to a former label that failed to reach his artistic and commercial expectations. Surviving all obstacles and controversy, Hopsin is now not only a successful rapper but also a producer, editor, actor and director. In addition, Hopsin is co-founder of indie power house Funk Volume. Funk Volume currently has over 215,000 YouTube subscribers and 235,000 Facebook Likes. Hopsin focuses on how to engage fans with both sharp lyricism and careful branding, and brings forth a unique attitude and charisma that makes hip hop unpredictable again. He released his sophomore album, Knock Madness, on November 26th.